Being healthy is always beautiful. 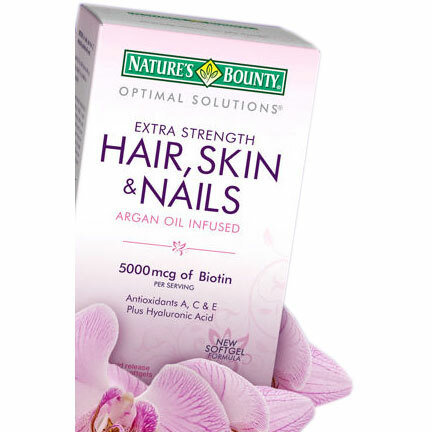 With Nature’s Bounty® Optimal Solutions® Extra Strength Hair, Skin & Nails formula with Argan Oil you’ll look good and feel great! It contains just the right balance of nutrients to support lustrous hair, healthy nails and vibrant skin. This innovative formula provides you with the vital nutrients and latest ingredients in beauty care to support your natural beauty from within. High potency B Vitamins help with energy metabolism and Biotin helps to maintain healthy hair and promotes healthy nails by acting at the nail matrix, the base of the nail. Vitamin E is an antioxidant that also contributes to skin health, and Vitamin C is involved in collagen production and formation, which forms the basis for vibrant skin. Vitamin A assists with skin maintenance and overall health. Health-conscious people have trusted Nature’s Bounty® for decades. Our dedication to quality, consistency, and scientific research has resulted in vitamins and nutritional supplements of unrivaled excellence. By combining the latest breakthroughs in nutritional science with the finest ingredients, we’re proud to provide you with supplements of unsurpassed quality and value. Nature’s Bounty® supplements are overseen by our scientists, manufacturing specialists and quality experts, each one dedicated to maintaining the highest quality standards. As part of our commitment to quality, Nature’s Bounty® only uses ingredients from suppliers that meet our stringent Quality Assurance Standards, as well as GMP food quality standards. Every Nature’s Bounty® product is subjected to numerous quality tests and assays throughout the manufacturing process to verify purity and full potency. As an added measure of quality assurance, the initial ingredients, as well as the final product are tested in our microbiological laboratory to make certain that the product is pure and free of harmful bacteria. At Nature’s Bounty®, we don’t just test and retest our products, we put our people and even our laboratory to the test, too. We’re proud that our facilities have been successfully audited by the United States Pharmacopeia and STR (Specialized Technology Resources), a leading independent dietary supplement quality evaluation firm.